“I’m not like you, I hate grocery shopping!” Someone said this to me recently and it made me chuckle. I do love grocery shopping (and I’m kind of a pro at it). But I know it’s not just a hobby – it’s a necessary task for everyone! I started to think about my approach to grocery shopping and how that really impacts my enjoyment of the task. If I wandered into a random grocery store on a Saturday afternoon without a list or a meal plan, I’d probably hate the experience just as much as anyone! 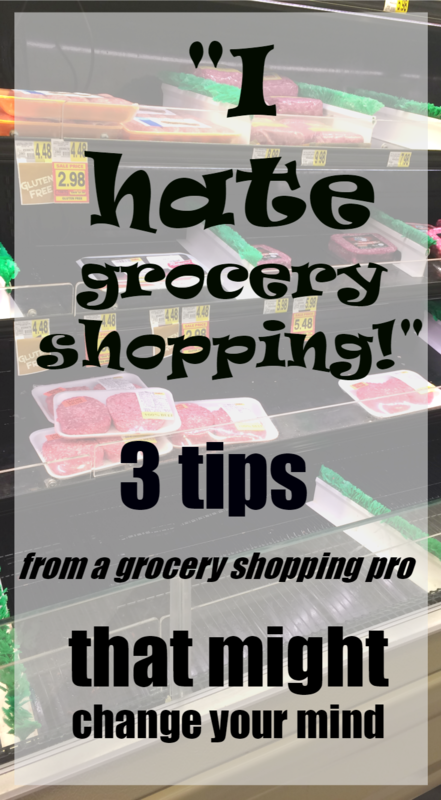 If you hate grocery shopping, I have three tips that just might change your mind! This requires a little bit of work before you leave home. Look through your pantry and fridge to see what you’re out of and/or what you want to buy at the store. I always make my lists from Southern Savers’ weekly rundown of my store’s sales – it’s sorted by department, which helps me not forget anything, and it’s always stored in the app in case I forget to print the list at home! It goes without saying that using a list helps you to pick up everything you need, saving you a dreaded return trip to the store! Additionally – if you want to increase your productivity, lower your grocery bill and reduce the chances that you’ll have to go back to the store the next day, try meal planning. If you can, pick one location of one store and always shop there. This way you will learn where everything is located in that store, saving you from spending time hunting for things you need. For example, I shop at one of two Aldi stores on a regular basis. One week I had to run errands in a different town and popped into that city’s Aldi. I couldn’t find anything and became very frustrated. Stores are very rarely laid out exactly the same! When you’ve chosen a “home” store for yourself, you can easily learn when is a good time to shop that location. I often ask cashiers or employees if certain days or times are slower and then arrange my schedule to shop during those periods! You may also want to avoid shopping while the aisles are filled with restocking pallets – some stores do their restocking in small batches, some do the whole store at once, making it really hard to get to the shelves. Personally, I shop my grocery stores on Tuesday and Wednesday afternoons and Target on Saturday evenings. I stop on my way home from work during the week – otherwise I’d go first thing Wednesday morning. If you really despise the act of walking the grocery store aisles, you might be able to find a store near you that offers online ordering! I tried Walmart’s version of this service – you can watch my full review here. There are lots of grocery shopping tips in my weekly grocery haul videos! I looked forward to reading this post as it’s always fun to pick up tips from someone who enjoys doing something that many people don’t. Great tips! Your “provided that you are nice to them” comment made me laugh. lol. I love seeing your fun personality come through in your writing, friend! What makes grocery shopping the most enjoyable for me is bringing along someone whose company I delight in. Jason and I often shop while our girls are at youth group. Checking off our grocery list together while catching up on the day’s events always ends in an enjoyable conversation and almost feels like a fun date night! lol. Other times I’ll grab one of my girls and go. We love chatting as well and it’s always fun to spoil them an offer of a special treat to thank them for making the errand more enjoyable. Thanks for sharing another fantastic post, friend! I don’t hate so much as hate the time it takes. I use to be so good at shopping sales when money was a little tighter and I really need to get back to that practice. Thanks for sharing! It does take time to shop the sales, I will definitely agree with you on that one! Asking the cashiers is a GREAT time. I always feel like I need to hit up Aldi first thing in the morning because if I don’t, they are out of things I want meaning I have to make another trip and that frustrates me to no end! Last time I wend I was there on the first day of the month, HUGE mistake. Oh yes, Aldi can be such a bummer if you go at the wrong time. I’ve found that the day after their new ad starts is the best time to shop – they are most likely to be stocked on the sale items. I just watched How To Lose A Guy in 10 Days…perhaps subconsciously I wrote this post as a “How to love your grocery shopping trip in 3 steps.” Ha! 🙂 I’m glad you were able to get credited for the extra purchase – that’s a great example of building report with your store! I love grocery shopping and I always have since a young bride. Your ideas are good ones.